Andrew Tidswell (blue) scored for Holbeach against Huntingdon. 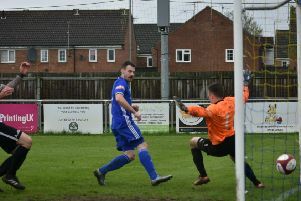 Holbeach United will attempt to close the gap on the top three in the United Counties Premier Division by winning at Wellingborough Town tonight (March 1). The Tigers moved into fourth place with a 3-1 weekend (February 27) win over rock-bottom Huntingdon, but they are nine points off the leading trio, albeit with multiple games in hand. Wellingborough are 20th in a 22-team league so Holbeach will be expected to win again and close that gap. Yaxley can get into the top half of the table with a win over Boston Town at Intuitive Park (7.45pm kick off). In-form Wisbech, who stretched their unbeaten run to six games with a superb win at title-chasing Leicester Nirvana at the weekend, will fancy their chances at Sleaford tomorrow. The Fenman are currently a place above Sleaford in ninth.